Gothic Gothic is a crepuscular family of 3 fonts—Regular, Text, and Black. 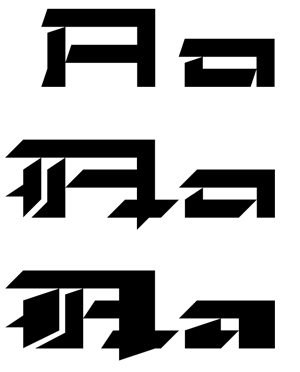 The Gothic Gothic family contains 2 companion fonts. Gothic Gothic Text is a more minimal variation that has a more roman looking style while still retaining some Blackletter feel. The 3 styles of Gothic Gothic. Gothic Gothic Black is a bolder version designed to tend more toward the Blackletter style of Gothic with more contrast of stroke and a few of the more unusual Blackletter forms thrown in for flavor. 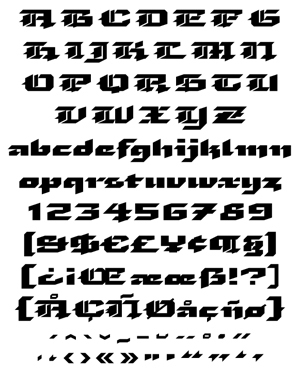 Basic character set for Gothic Gothic Black.